Sorry its been a while since my last post, I have been super busy making preparations to move from Auckland down to Waihola and have not had too much time to put towards my own projects. I will be moving on the 21st so will more than likely be offline for a week or so until we can get everything straightened out again in the South Island. In the mean time I have been busy recording my brain waves onto the school hard drives so that a small part of me can live on and manipulate the minds of future generations of south seas animation students! 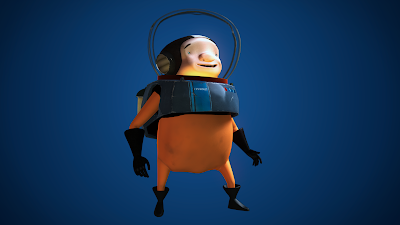 On my own front I have been testing the spaceman rig and ironing out any bumps, kinks, and bruises in the rig so that he is ready for the school project which starts production on the 8th of July. Our second year students are busy working on pre-production design work for the world, props and vehicles as we speak. All I can say is that the project is looking like its going to be a doozy this year, and I will be looking forward to seeing the completed product. Posed and lit test render of the "Spaceman". Yes it does a bit! Thanks for visiting my blog.